A big, delicious lunch salad is absolutely the best! I love having a big bowl of fiber-filled vegetables and nutrients to help power me through each and every afternoon. One of the salads I love in particular is a cobb salad, however often they’re loaded with lots of calories and fat. 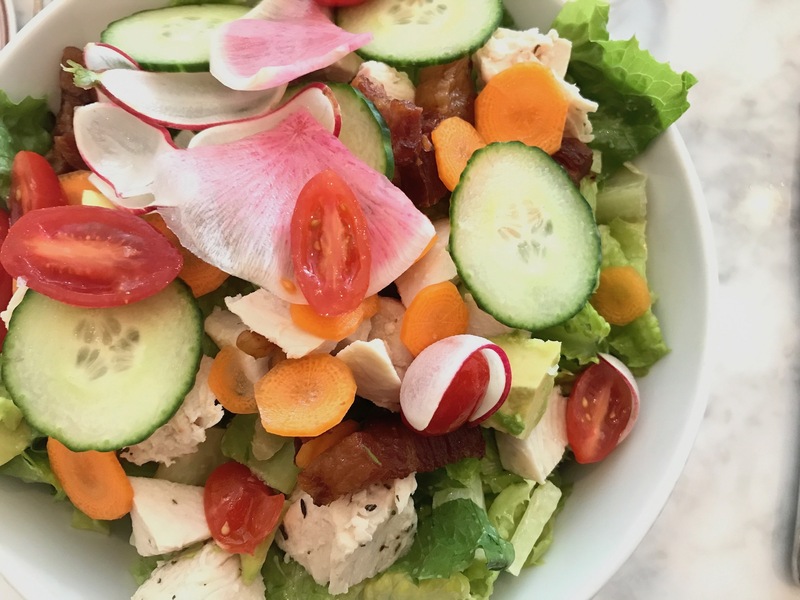 So I wanted to share with you my version of the healthy(er) cobb salad- it’s got extra veggies, but still contains some of the basic favorites- chicken, bacon and avocado. Try this salad with any of your favorite veggies added on top- especially if you have seasonal, delicious produce in your fridge that you want on top of your salad. You can also add any of your favorite proteins if you want to use instead of chicken- like shrimp, steak etc. Try to keep the dressing light because there’s enough going on in the salad- so leave out the heavy dressings like french, ranch etc and use a basic vinaigrette! Enjoy this yummy and beautiful salad. A pinch of your favorite herbs and spices- you pick! 1. Wash and prepare the salad ingredients. 2. Add the salad ingredients to the bowl you plan on serving them in. 3. In a small bowl, mix together the dressing ingredients with a fork or a whisk and combine until well mixed. 4. Drizzle the dressing over the salad and mix together until the dressing is combined well into the salad. For more salads, click here!